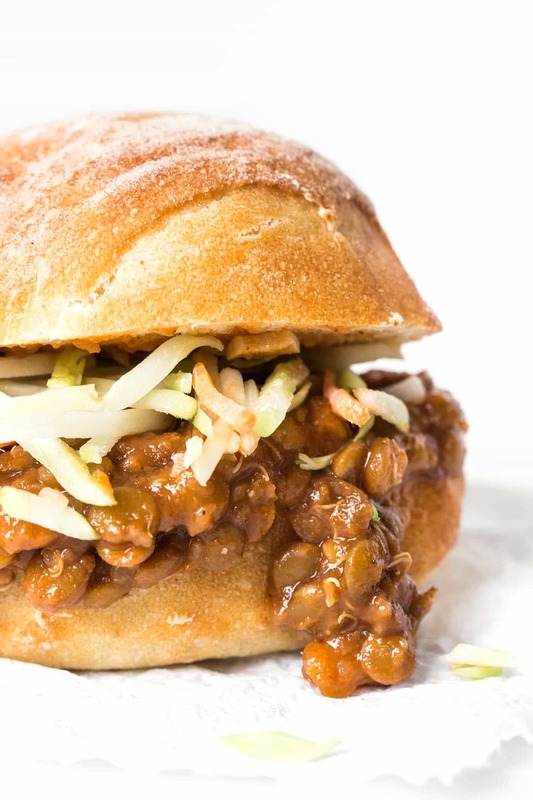 This plant-based version of the all-American classic, these lentil sloppy joes have all the same flavor without any of the meat. And they're a cinch to whip up. Just toss everything in your slow cooker and let it do the work for you! I got the idea for this recipe from my brother. He made my quinoa sloppy joes recently and was raving about them, and sent my sloppy joe craving into overdrive. But since I'm no longer eating meat, I had to come up with an alternative. I've often used quinoa in things like vegetarian chilis and soups to lend somewhat of a meat texture, but I knew this recipe couldn't be 100% quinoa. Beans are the logical next step, but anything like a chickpea or white bean would just throw the texture off. The best solution: lentils. 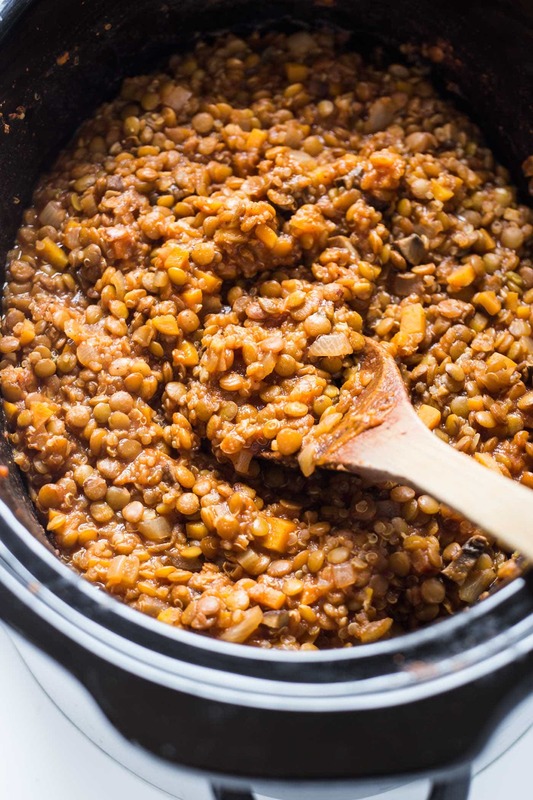 Lentils have a surprisingly meaty feel to them when they're cooked. They have this interesting quality about them, where they kind of break down as they cook, but also keep their shape at the same time. And they ended up being the perfect plant-based solution for these sloppy joes. To add a bit more depth to the dish, I also added some finely chopped carrots, onions and mushrooms, all of which help give these sloppy joes more flavor, but also a more complexity in terms of texture. I wanted to make sure the recipe was as simple to make as possible, so I threw everything in the slow cooker and let it do its thing. I kept the recipe pretty much the same as my other quinoa sloppy joes, except that I obviously swapped the meat for lentils and ended up having to use a bit more liquid. I also decided to use vegetable broth instead of water to give them more flavor. And friends, these are seriously THE BEST. I've now served them on three occasions and each time people can't believe they don't contain meat. They have that wonderful tomato-barbecue flavor, are perfectly sloppy and make the greatest sandwiches! For my guests, I served them on ciabatta rolls, but you could also use your favorite gluten-free biscuit (my Quinoa Biscuits are great! 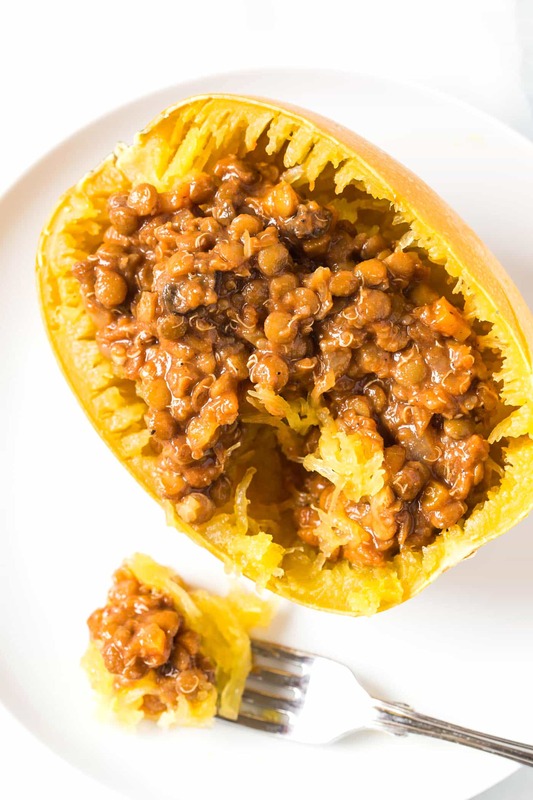 ), or you can do what I did and toss everything into a spaghetti squash boat. What's your favorite slow cooker recipe? I'd love to get some ideas as we move into the winter time! I definitely didn't use my slow cooker much last winter, so I want to this season. 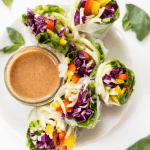 And don't forget…if you end up making this recipe, or any others from the site, tag @simplyquinoa or use #simplyquinoa so I can find your pictures and give you some love in return! 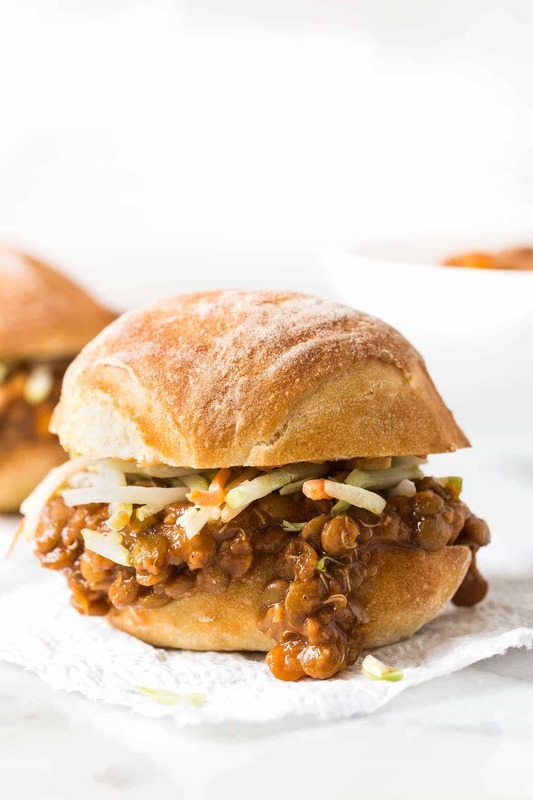 This plant-based version of the all-American classic, these lentil sloppy joes have all the same flavor without any of the meat! Add everything into the slow cooker, starting with 3 cups of broth. Stir to combine, cover and set to high. Cook on high for 2 - 3 hours (or low for 4 - 6). Check and add more liquid as needed. When my crockpot died, i replaced with an IP. How would you cook this in an IP? I haven’t tested it in an IP, sorry! I would say no more than 10 – 12 minutes on high though. This looks great! Just wondering what size crock pot you used? This was an 8qt I believe! I found this recipe a few months ago and my vegan family loves it! It’s now become an added staple to the vegan lifestyle. We don’t care much for spicy so I eliminated the hot sauce and it’s perfect. Thanks! Hi Alyssa, I made this last night and I didn’t have any hot sauce so I used a table spoon of Jerk seasoning from the jar. It tastes really good, nice and spicy. I was wondering how much is in a serving? Thanks a lot for all your great recipes. About 1 cup 🙂 Glad you enjoyed it! I really wanted to love this, but I found the flavor insipid and overly sweet. I think part of the problem is the lack of fat in the recipe. I’m going to try sautéing the onions, garlic & spices in a glut of olive oil before adding to the slow cooker. 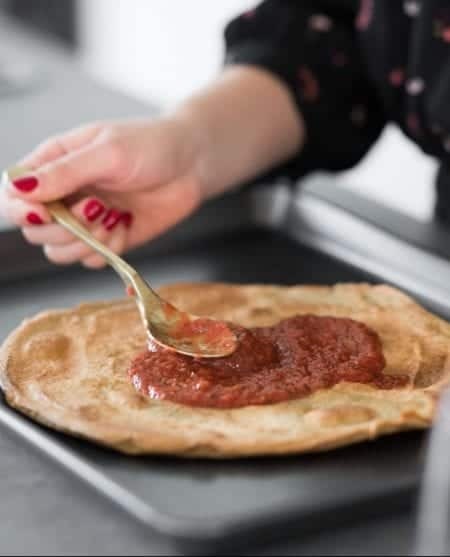 Otherwise I don’t think there’s enough savory to stand up to the sweetness of carrot + tomato sauce+ ketchup + maple syrup, etc. I made the sloppy joes tonight…..and it was deeeeeelicious…..
Just made this minus the hot sauce. Delicious! Just found this recipe & made it today. I used sriracha instead of hot sauce & it was amazing! Love this recipe! I just came across this recipe and have everything to make it except the brown lentils. I have green and red, I read your comment about the red ones being too mushy. Would green be okay ? This recipe is delicious! Made it tonight with a few modifications, the major one being that I replaced the mushrooms (just don’t like ’em!) with jackfruit. Jackfruit is very nutritious and has wonderful meaty texture but very little flavor, so it worked really well. Also, I made it stovetop. Started by sauteeing the carrots, onions and garlic, then added the jackfruit, then the seasonings, then everything else. Since I didn’t use a crock pot, the broth was not needed. I did NOT let it simmer a few hours — rather, I served it when the vegetables were soft and everything was heated. Simmering might add extra flavor, but it was perfectly delicious without it. I was concerned that 2 TBSP of hot sauce would be too much, so I used about 1.25 and that was plenty for my palate. Might go down to 1 next time. Also replaced the maple syrup (didn’t have any) with agave syrup and used only 1 TBSP. My husband (a carnivore) and I (98% vegetarian) both loved it. I didn’t even use a bun — just ate it out of a bowl like chili, topped with some grated monterey jack cheese. The recipe makes a lot so we froze some of the leftovers. This looks delicious! Do you think it’s possible to double this recipe within a standard crock pot, or will the crockpot be too small? Also, wouldni need to adjust the cooking time and amount of broth? Thanks so much! Do you have any advice on making this on a stove top? I don’t have a crockpot but this looks amazing! I made it stovetop. First, make the quinoa while chopping the veggies. Then, in a large pan (I suppose a large pot would also work), saute the veggies until the carrot is soft, then add everything else and mix well. It’s ready to eat when the food is hot! This sounds great! Just a quick question for you though – i noticed you have the nutrition facts posted but there is is no serving size listed. Do you know what the serving size is for these nutrition facts? Thanks!! Alyssa, did you soak the lentils overnight, or, at all? Thanks. I’ve made this four times now- soooo good and everyone I’ve made it for loves it! Thank you! Amazing!! I’m so glad you’re enjoying them!! I made this tonight in my Instant Pot on manual high for 25 minutes and then did the quick release. It was perfect!! I did omit the hot sauce because my hubby doesn’t tolerate hot spicy foods. However, it was still awesome!! So glad you enjoyed it and thanks for sharing the Instant Pot info! Hello I would like to make this but I’m not a fan of mushrooms, would it be OK to leave them out or do you have a recommendation of something that I should substitute? 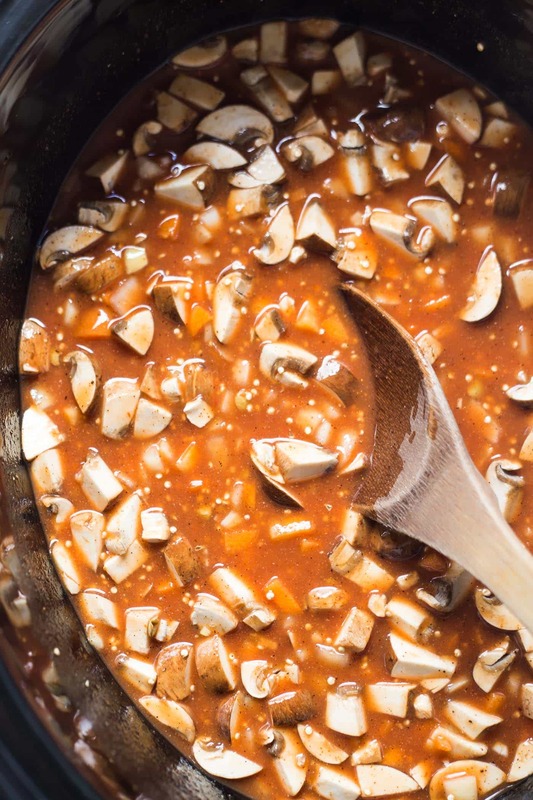 I replaced the mushrooms with jackfruit (unseasoned) and it was a great addition. Very nutritious and hearty. I think you could leave them out or substitute diced tomatoes! These are so good! Made them twice so far and am making them for a party next week! Thanks for posting this recipe! This was absolutely delicious! Even my meat loving fiance raved about it and made sure there wasn’t any wasted (he cleaned both our plates lol). Thanks so much for the recipe! In your picture it looks like you have coleslaw on them. Is that what it is? Actually not, it’s just a pre-shredded broccoli/carrot mixture 🙂 But you could definitely serve it with coleslaw! I’ve just discovered your website after looking to head to the plant based route from now on. Can i used red lentils or do you recommend only black ones? You can yes, but the cooking time and texture will be totally off. Red lentils cook in about 10 minutes, whereas this one cooks all day long, so it might take some experimentation on your part if you go that route 🙂 Keep me posted! Wonderful neal over a huge baked potato! Trying this for the first time today. As I’m a confirmed carnivore I’m a bit sceptical but prepared to try anything once. Since spending a month in India with work last year, and really enjoying the non-meat diet over there, I am trying to add more vegetarian meals to my diet. After finding quinoa is more expensive than gold in the UK (never needed to look before) I have substituted bulgur wheat (after searching online for a substitute). Looks great in the slow cooker as I put the lid on…….off out for the day now but hoping for a great dinner in about 7 hours. Excited to hear how you enjoyed it! It would be great to have Instant Pot conversion for this recipe. I think I can figure one out. I will try it. Let me know how it turns out! I don’t have an Instant Pot, so I’m not sure about the conversion process! I’d love the recipe for my instant pot. Where did you post it please? 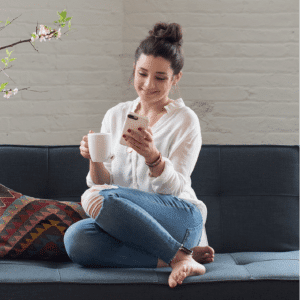 Would you mind sharing your instant pot instructions? Time, setting, NPR or quick release? How much broth used? sheena, how did you do it? Can you share the converted recipe? 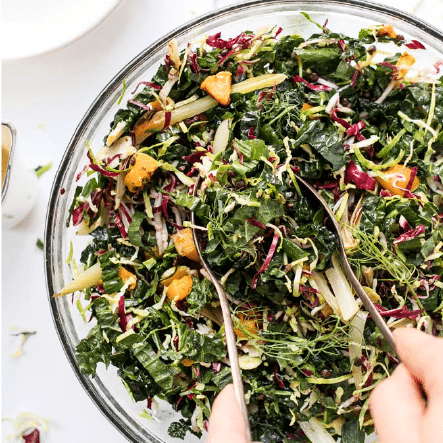 I would also love to know how you made this in the instant pot! I was going to try it this week bu cannot find any info on the web about how to convert it. I had eaten something similar to this recipe at a vegan restaurant here in my city and LOVED it! I was so EXCITED to find your recipe here! I am not very fond of spicy hot food or the flavor of hot sauce so I am going to substitute Worcestershire sauce for its flavor and perhaps add some sweet red bell pepper and possibly some tomato as well! I can’t wait to see how it turns out in my own slow cooker! Thanks, Alyssa, for all your healthy, hard work in bringing us GREAT new ways to use quinoa in our meal plans! This is fabulous. About to make another batch. I gave some to my meat eating son and he loved it also. Going to keep this in my freezer. So easy and delicious. Thanks for the great recipes. Going to try the meatloaf for tonight’s supper. I have a feeling it will be just as good. My recipe came out like a soup. Did you use dried lentils? I did, yes. Did you? Sorry it didn’t turn out like you hoped! This happened to me also,should have used dried but I transferred it to the stove and thickened it. So delicious! Sounds yummy! 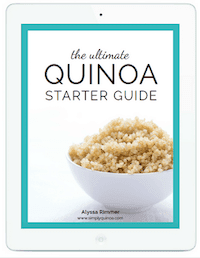 Do you cook the quinoa first? Thanks! This looks so good, I really want to try, but isn’t this a lot of sugar? I haven’t calculated it, so I’m not positive. Feel free to reduce some of the ingredients if you think it’s too high in sugar! 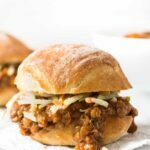 Love the sound of lentil sloppy joes made in the slow cooker! Think this could be done in a pressure cooker (it’s all I have). Great video too : )) Enjoy your trip to Thailand! Yes, I would like to use my pressure cooker, but nor sure how much liquid to add. Have you tried it yet?